A thug who scarred a man for life by smashing a pint glass into his face has been ordered to pay his victim £1500 compensation. Paul Tarimo’s “wicked and brutal” assault narrowly missed Michael Godwin’s eye and left him with significant scarring on his face. 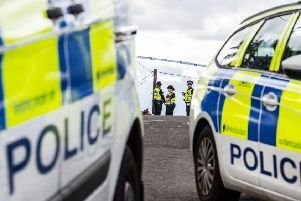 The “horrific” attack happened as two groups of men playing pool and darts in The Crown Public House in Linlithgow High Street, West Lothian, on 18 March 2017. Words were exchanged between Tarimo and Mr Godwin and the accused, who was holding a pint glass in his hand, smashed it into the other man’s face then punched him twice in the face. Mr Godwin fell to the ground with blood pouring from the wound caused by the tumbler attack. In addition to paying compensation, Tarimo, 36, was put under social work supervision for 18 months and ordered to carry out 300 hours of unpaid work under a community payback order. Passing sentence, Sheriff Peter Hammond told him that a community sentence was an unusual disposal for such a violent offence and set out reasons why he was being so lenient. He said he had taken into account Tarimo’s early guilty plea, his genuine remorse and the fact that he had taken successful early steps to address his “problem” with violence and was becoming a facilitator on the Alternative to Violence programme to help others. In addition, he took into acknowledged the serious health issues faced by Tarimo’s wife and child and the serious family consequences which would result from him, as the breadwinner, being jailed. However, he told Tarimo he had pleaded guilty on indictment to a serious charge of carrying out a “horrific attack” on another patron in a public house. He said: “You struck him in the face with a glass and you punched him on the several times. “Photographs show the site of the wound made by the glass which has extensive stitching in the area of the eye and this will leave a permanent disfiguring scar. “It’s evident from the photographs that this narrowly missed his eye, which clearly would have had tragic consequences if it had connected with his eye. In addition I have been provided with a victim impact statement which indicates that in addition to his permanent scars which he will be left with, your victim continues to suffer psychological effects due to this attack. “He has been left suffering nightmares, anxiety, fear of strangers in public places and a loss of confidence and self esteem in social interaction with the world. He went on: “You are no stranger to the criminal courts having been convicted of offences of violence and disorder in the past, including assault on two occasions – one of which was by causing injury – although I accept that these offences took place some considerable time ago now. “By your actions you have placed yourself and your liberty in jeopardy and a custodial sentence would be the first and uppermost initial consideration of a court in dealing with such an offence. “The question for me is whether a custodial sentence which would be of a significant duration would be the only appropriate disposal or whether an alternative in the community is viable and could be considered. He said the community sentence was a direct alternative to prison and was “not intended to be a soft option”.